Occasionally, amongst my many duties as a Graphic Designer, I get a chance to work on internally-focused projects. These include finding new ways to increase the impact of a presentation for someone else's idea pitch; or producing a short video series about exemplary coworkers who deserve awards or recognition. It surprises me so often — as an ego-driven person and self-aggrandizing type — that these are some of the most rewarding and gratifying projects I do. It's one thing to spend days and weeks on a campaign to push the agenda of a multi-million dollar company. Ads, signs, energy, and media of all sorts are brought to bear on their behalf. However, the individual employee or project rarely gets the same kind of attention. I kind of like it when I get to shift the view a little bit — maybe then the BIG company looks inward and gets to see some of it's best and brightest in the spotlight I've set up for them. It takes just as much work, and I'll spend just as much time on a deserving employee's video package as I will on product launch. After all, they deserve to shine equally. Talking to clients: It's discussion, not dictation. How to talk to clients: Speak. Listen. Speak some more, listen some more. Reach understandings and then spark new ideas together. Whether you're working for freelance clients, or fulfilling in-house design jobs, remember that you are never working alone. This is true even if you're the only one drawing, compositing, doing layouts, and all actual work of designing. Take that to heart. Especially during the important in the first phase of a project. All too often, this is where the client describes what they need to a designer. Then the designer gets the job details, (deadline, pay, dimensions, scope), and goes away to toil alone. He/she then returns a week later and presents the work for approval or revisions. The scenario described above shows a missed opportunity. It seems mercenary and cold. When you're in the first stages of any project, the chance is great that neither you or the client have a fully formed grasp on the best way to execute the thing. This is the ideal time to make your clients into collaborators. Slow down and start engaging them about their thoughts, hopes, and goals for their project. Find a deeper understanding so you can offer suggestions and get feedback about your own ideas. This usually results in the best possible project and higher satisfaction overall. I've used client/project questionnaires in the past, like this excellent one from Ivan Raszl for indentity projects. "A good brief is half success with an identity project. If you have all the information and an in depth understanding of your client's brand you will have the basis for a great logo and striking identity. Without it you're just shooting in the dark and can only rely on your luck to find the right solution. " (Emphasis mine). That questionnaire is one of my favorites. Still, I've found that nothing beats a good long discussion. Make it casual, but active and focused. Don't be overbearing. Take plenty of notes, and feel free to sketch and present your rough ideas. I've gotten great feedback about this way of working. I highly recommend it. Smart. Easy to forget. Ultimately essential. Your notes only need to make sense to you. It's fall fast and dirty at the capture stage. The notebook sure seems like an obvious thing. We take it for granted, leave it behind, grab any scrap of paper handy, or write on the nearest clean napkin. As I've become more experienced in the field, I've come to realize how important it is to keep my notebook in my bag at all times. Some designers are legendary for their notebooks, such as in this story from Michael Beirut, on Design Observer. "On August 12, 1982, I took a 10 x 7 1/8 inch National Blank Book Company composition book from the supply closet of my then employer, Vignelli Associates. From that moment, I have never been without one. I always have one at my desk. I take one with me to every meeting. I am now in the middle of Notebook #85. It's in front of me right now. Together, these well-worn books create a history of my working life that spans three decades. Now that's a feat of mindfulness to which one can aspire. My notebook, which is a Pentalic Illustrators Sketchbook, 8-Inch by 5-Inch, Espresso is one of the most valuable things I carry daily. Whether I'm in a design session, meeting, or just sketching, it adds tremendously to my sense of security. Every action, idea, exchange, and offhand suggestion goes into the notebook. Nothing is forgotten. Doing it this way has another benefit. It's a lot like the way thumbnail sketching on paper helps you work out solutions to design problems before you ever touch a computer. Writing down everything as it happens gets your mental engine working on solutions in the background. 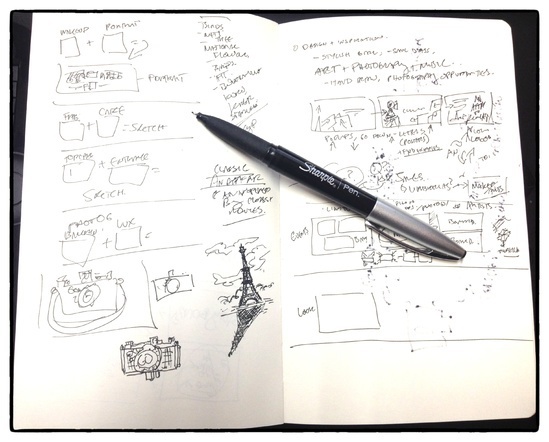 Make sure your notebook is large enough to show quick sketches and diagrams to other people. I used to carry around a hip-pocket-sized Molskine sketchbook, which served me well at the time. However, to share a drawing during a meeting, I'd have to pass the notebook around. People would have to squint. That wasn't ideal. Carrying around a larger book is more cumbersome, but the benefits more than make up for it. The larger pages accommodate my noodle-like idea-stage drawings, wild scrawling and multiple nested mind maps. Best of all, I can keep the book in my hands and the pictures are still visible to people across the table. Don't spend any time deciding what does, or does not, go from your pen to the page. If it's on your mind, then it's notebook worthy. Sketches, phone numbers, random thoughts, nervous doodles, it doesn't matter — it's all fair game. The time to judge those ideas is later. If you ever say to yourself, "I don't need to write that down," take it as a signal to get out your pen and start writing. By the way, use a pen. Erasing is forbidden if you want to do this right. I've gone back and forth between using paper and an iPad for my notes over the years. I love using the iPad for most things, but I really enjoy the immediacy of scrawling in a notebook. Maybe it's just conditioning, but sketching on a screen makes me think 'end product,' instead of 'rough drawing.' If you don't have that particular mental block, I recommend the app Penultimate available at the iTunes app store for $0.99 . It's easy to use and just feels the most like a real notebook of any app I've used. As digital workers, many designers stray from the analog basics. If you adhere to at least one old-school method, make it a notebook (or simulation, thereof).